What a great night of music! The Electric Owl is packed with an enthusiastic audience and there is standing room only. They have come to see the best and they are not disappointed. 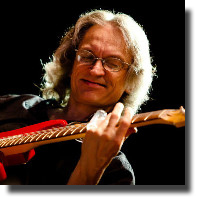 Sonny Landreth is a fantastic guitarist and draws an appreciative audience. He makes sounds and moves on his guitar that I personally have not seen or heard before. The music fills my soul, and many of the foot-stomping audience would be dancing if there had been room for it. The music is high energy and is produced by accomplished artists like special guest Sonny Landreth, Steve Dawson and the Black Hen House Band. Several individuals that I had the pleasure to talk to, who were also musicians, seemed to idolize the guitar playing ability of Landreth. Landreth is known for a technique in which he strums, taps, slaps, and picks with an original right-hand technique using all of his fingers on his right hand. The guitarist shows his great sense of humour just before he introduces the next piece of music. I think the humour comes from Breaux Bridge, Louisiana. The slide dueling between Dawson and Landreth is wonderfully executed and fun. The crowd shows great appreciation for the talent before them with loud applause and a standing ovation. This is my first visit to the Electric Owl. This venue seems to have become one of the “in” places to go in Vancouver for great Blues. The show was a guitarist’s dream to witness. Landreth is a master of the guitar. A professional guitarist, music student or just someone who loves great blues should make a point of seeing him perform. I would like to add however, that it would be best, if seats would have been reserved for me, the reviewer, so that I could see the show. I wound up standing behind the keyboard right in front of the stage and I could not see the group fully until I started sharing a chair with another person down in the front row. There were other people who had reserved seats two months before, but the reserved seats were not there for them during the performance. This should be something to look into for future shows. The Electric Owl invites a special guest once a month to play with Steve Dawson and the Black Hen House Band. It is an exciting night and should be marked on your monthly calendar if you really, really like great blues.